The most stringent requirement for this garden is sun. The more the better. And the closer the garden is to the back door, the more you will be drawn to it, whether to dash out to pick a few leaves of lettuce, or to pull a wayward weed. This garden can be, probably should be, small. Let’s assume it is ten feet by ten feet. The second requirement is soil that does not stay sodden for hours after a heavy rain. Push a can with both ends open into a hole in the soil and add water; it should drain faster than an inch an hour. If not, choose a new location or make raised beds. With sun and water taken care of, soil preparation begins. And ends a few minutes later! Blanket this area with a four-sheet thickness of newspaper (do not use colored pages), overlapped and wetted. Done, almost. The newspaper will smother existing vegetation, and keep out weeds during the growing season. And as the paper rots away, it will enrich the soil. The planting plan is simple: divide the garden into four beds, delineated by two 18 to 24 inch wide paths going up the center of each side and crossing each other in the center of the garden. Cover the newspaper in the paths with wood chips, wood shavings, sawdust, or pine needles. In the beds, purchase some weed-free compost, enough to lay at least a one-inch depth over the newspaper. Sow seed right into the compost layer. Peas and lettuce need to be planted early — as in now — because they both enjoy cool weather in rows about a foot apart. Make each pea row four inches wide, then scatter the seeds so they are about an inch apart down and across the row. The next wave of planting takes place after warm weather has settled, in late May. Buy tomato transplants and set them in one of the northern quadrants. If needed make a hole through the newspaper into the soil below to accommodate the full depth of the transplant. Grow a variety for flavor, like Brandywine, Sungold, or Amish Paste. Each plant should be two or three feet from its neighbor, depending on whether you are going to stake your tomatoes or allow them to sprawl. Eventually you will have a jungle of vines in danger of overtaking or enlarging your garden, so take a few minutes occasionally during the summer to prune wayward stems from the tomato plants. Plant sweet corn and cucumber seeds at the same time as tomato transplants. Since corn is a tall grower, it gets the other northern quadrant. Plant three seeds together in “hills,” which are groups of seeds, not mounds of dirt, spaced two feet apart each way. Cucumbers get the final, southern quadrant. Sow six seeds per hill, with hills three feet apart. Grow a bush-type cucumber, like Salad Bush or Bush Pickle. Once the corn and cucumber seeds are up and growing vigorously, ruthlessly thin the plants so each corn hill has only one plant and each cucumber hill has three plants. This garden gets one final planting in early July. But where, since all four quadrants are used up? Pull out the peas and lettuce, which flag anyway during hot weather, and plant in their place bush beans. Bush Blue Lake and Bush Romano are good choices. 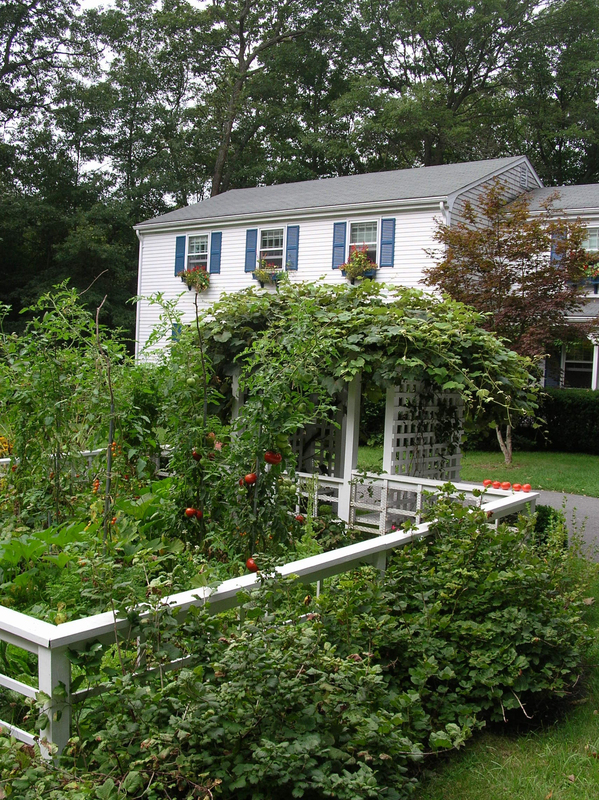 This garden will produce a limited amount of vegetables with a minimum amount of work. Success may tempt you to enlarge your garden and grow a greater variety of plants next year. A gardening friend called to ask how much compost is needed to cover his garden. It turns out that a one inch depth of compost will supply all the nutrition, plus a lot of other goodies, that a vegetable garden needs to nourish the plants for one year. So that one-inch depth needs replenishment annually. Back to the amount needed: 1/3 of a cubic yard (300-500 pounds, depending on moisture) will cover 100 square feet 1 inch deep. That’s a lot of compost, which beginning gardeners will likely be buying. If you’re buying compost in bulk, which is the least expensive way to purchase it, make sure it’s good stuff by asking some questions, such as what went into the compost. Avoid using compost that contains industrial wastes — especially in the vegetable garden — because of possible toxins like excessive quantities of heavy metals that could contaminate your food. Also ask how the compost has been prepared and stored. The ideal would be to make enough of your own compost. Next year, perhaps. This entry was posted in Design, Gardening, Vegetables and tagged compost, no work, vegetable garden. Bookmark the permalink. Trackbacks are closed, but you can post a comment. great way to plant a small garden the weed free easy way! Like it! Trying it today! Lee – I forwarded your “quick start” post to my son. This is his first spring in his first house and he wanted to start a vegetable garden. My wife and I had a belated Mother’s Day dinner with him and his wife last night and sure enough, he had followed your instructions prefectly. Now if can just keep his very large and inquisitive puppy out of it (he does have a fence) all should be well. Many thanks for the clear and simple advice. I am headed to my garden now to plant beans. Lee, I read your book “Weedless Gardening” and decided to give it a try 18 months ago. We went to mostly raised beds and used your suggestions for filling. I have to say I couldn’t be more pleased. Weeding now takes maybe 15 minutes in our 6 beds and the plants thrive. We’ll be adding more raised beds soon, until then we just use 8 foot by 3 foot plots. Thanks for the great book. Hi, I need some advice on something that’s wormed its way, literally, into the young leaves of my beet plants. It looks like a small flat worm that has insinuated itself between the front and back layer of the leaves, leaving them brown and dying…the garden is organic, what do you recommend? Thank you! It’s appropriately call a leaf miner. I recommend doing nothing. Beets tolerate a certain amount of damage from this insect. We just moved to a home with a huge front yard that has been a lawn for 60 years. Just read Weedless Gardening and plan to start a large garden for the fall or maybe even next spring, as my job and fixup on the new place must be my first priority (sad but true). My long-time gardener friend says your method will not work on an established (no chemicals) lawn because the existing grass roots (of several varieties) will not allow my future vegetable roots to penetrate deep enough. He insists that I must first turn the soil in order to break up the old root structure. Also, the soil test says we need lime and some other minerals in order to make the soil productive. Can you offer advice as to how I should proceed. PS- at our former home I used the Square Foot Gardening method but want to use your method from now on. Your friend is wrong. My “weedless gardening” method has been used in all sorts of sites with great results. If lime or other minerals are needed (as confirmed by a soil test! ), just sprinkle them down before covering the ground with the paper and then other materials spelled out in the books. Grasses have extensive, fine root systems which rot away to leave a crumbly soil, ideal for plants. Turning the soil will add so much air that much of that organic material will “burn” up and the good structure that developed underneath the grass will be ruined. Now I will proceed to use the Weedless Gardening method–with confidence. Hoping this year to use the information in Weedless Gardening to make my own compost. In the meantime, wondering if you had any thoughts about Ulster County Resource Recovery Agency’s compost, which is made from food and yard waste. Should I be concerned about herbicides or anything else? I’m not familiar with that specific compost. You could ask if it’s been tested for nutrients, heavy metals, and pesticides. My guess is that it’s probably okay, but they really should have it tested periodically. What can I do about squash bugs…they have taken out my squash for the last 3 years.? It does not seem to matter where I move them or if they are in pots or in the garden. Loved your books! Cover with floating row cover except when blooming, to allow for pollination. Slit stem lengthwise at bore hole and inject Bacillus thurengiensis. Plant squashes not usually attacked by squash vine borers, such as butternut squash, cucumbers, melons, and watermelons. A second planting of summer squash made in early July will mature after adult borers have finished laying eggs. Cover stems of vining squashes with soil and a stone; roots will form, supporting the plant, beyond where borers had attacked.